Religious leaders and activists, testifying before the Tom Lantos Human Rights Commission of the U.S. Congress on March 26, told of numerous attempts by the Vietnamese government to persecute the communities of faith that do not accept government controls. Schwartz further brought up the suppression faced by Khmer Buddhists in the southern province of Soc Trang, many of whom were sentenced to long prison terms just in the last six months. Specially appearing before the commission are two religious leaders who spoke from Vietnam via video, Catholic priest Phan Van Loi (Phan Văn Lợi) and Cao Dai Sub-Dignitary Nguyen Bach Phung (Nguyễn Bách Phụng, pictured). “Sub-dignitary” is a clergy designation in the Cao Dai religion, roughly equivalent to a Christian minister or priest. Father Loi testified that, 33 years after his consecration as a priest, he is “still unable to function like a priest” because the government has been holding him in detention for his campaigning for religious freedom. In Vietnam, civil society is forming, he said, including “the Catholic Church and organizations within the church.” However, the government is blocking the development of civil society, using administrative control devices. Representing the North Carolina-based Montagnard Human Rights Organization, the group’s Executive Director Rong Nay told the panel that the oppression by the Vietnamese government is “systematic” and includes forcing Protestants ethnic minorities to renounce their faith. “Any changes has been in name only,” Nay said, referring to the religious and human rights of Vietnam. Also testifying is the Director of Policy Advocacy of the Hmong National Development, Yunie Hong, who testified to numerous instances of discrimination and mistreatment of the Hmong minority people of Vietnam, especially in the northern part of the country. Hong specifically talked about the trials against Hmong Christians that has already resulted in three people convicted under Article 258 for “abusing freedoms” and a fourth trial to resume next week. The hearing room was packed with Vietnamese-Americans who had come to the Capitol for a two-day Vietnam Advocacy event, organized by BPSOS, a community service and advocacy group based in Virginia. The event has drawn more than 600 people to Washington DC, BPSOS said, who will knock on the doors of their representatives seeking support for human rights in Vietnam. On Wdenesday, March 26, the Tom Lantos Human Rights Commission held a public hearing on the persecution of religious and indigenous communities in Vietnam. The hearing focused on Vietnam’s persecution and repression of faith and indigenous communities, and also examined the U.S. government’s response to these human rights abuses. Notably, for the first time, the Commission hearing featured prominent activists testifying directly from Vietnam. These brave individuals provided first-hand accounts of the abuses suffered by their respective communities. In the 1970s, following the emergence of the Socialist Republic of Vietnam under the Communist Party of Vietnam, the government disbanded the leadership of all independent-minded religious organizations; and the country’s Communist cadres quickly appointed new leaders of these organizations. Further, as stipulated by its 2004 Ordinance on Religion and Belief, Vietnam’s government requires all religious organizations to be registered and their activities pre-approved. Organizations that refuse to register or whose registration applications have been denied risk having their activities deemed illegal and expose their leaders and followers to arrest and harassment. More recently, the 2013 Government Decree 92/2012/ND-CP banned all religious, cultural and traditional activities – even when conducted in private homes – unless they are registered, pre-approved, or officiated by a government entity. In addition, the government’s policies of land appropriation, population displacement and prohibition of indigenous languages in schools have altered the identities of its indigenous peoples and weakened their cultural heritage. Today, there is virtually no authentic representation of indigenous peoples in the government of Vietnam. 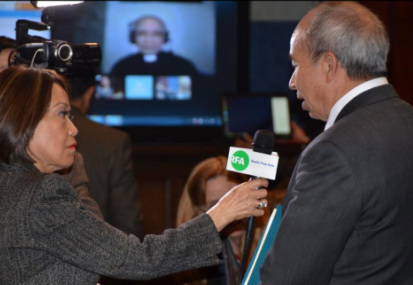 As Catholic priest Phan Van Loi testifies before the U.S. Congress via video, RFA interviews Rong Nay, executive director of the Montagnard Human Rights Organization.